Tarot Deck Update and Announcements! 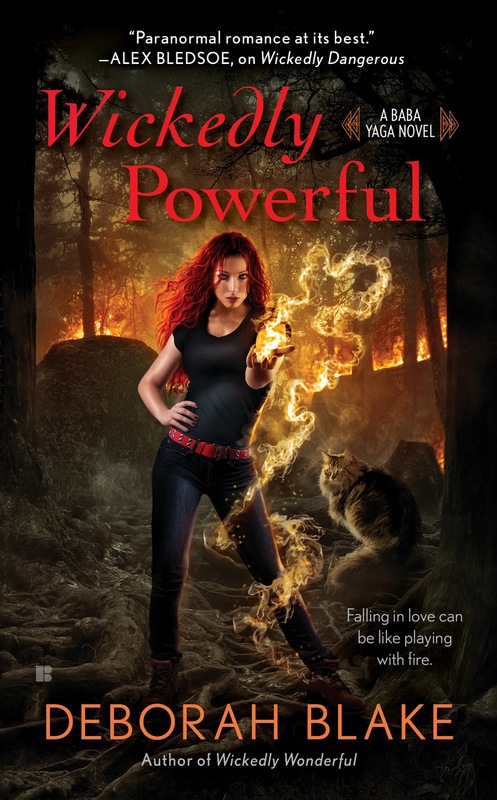 Veiled Magic Update and Giveaway! 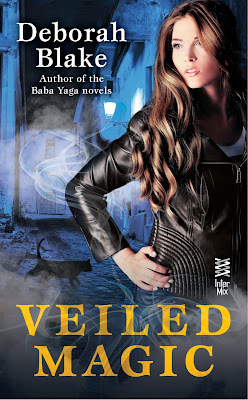 One Week to Veiled Magic! Flash Giveaway! This was an insane year for the writing--probably the busiest I have ever had. I wrote the book for the fabulous Llewellyn Tarot Deck I'm doing with illustrator Elisabeth Alba. I signed the second contract with Berkley for the next two books in the Baba Yaga series, a novella, plus Veiled Magic, the urban fantasy I'd written a few years ago. 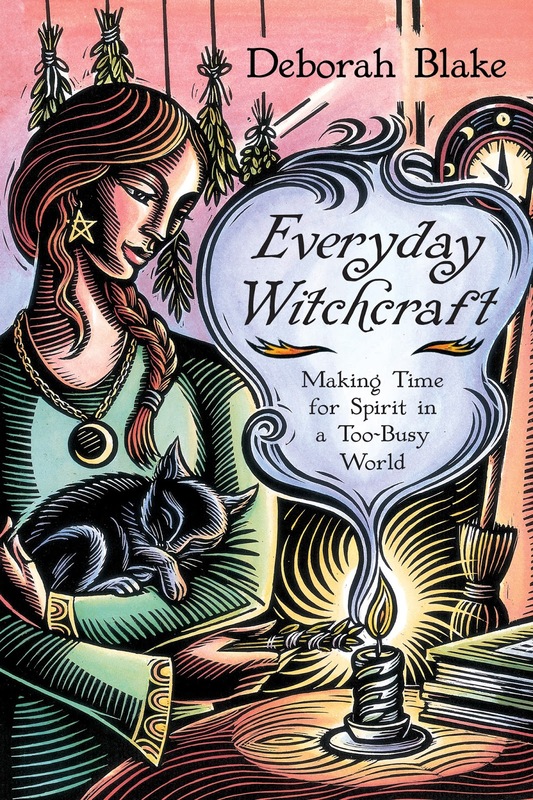 Everyday Witchcraft came out from Llewellyn in April (and is still #4 in Books > Religion & Spirituality > New Age & Spirituality > Wicca, Witchcraft & Paganism on Amazon!) 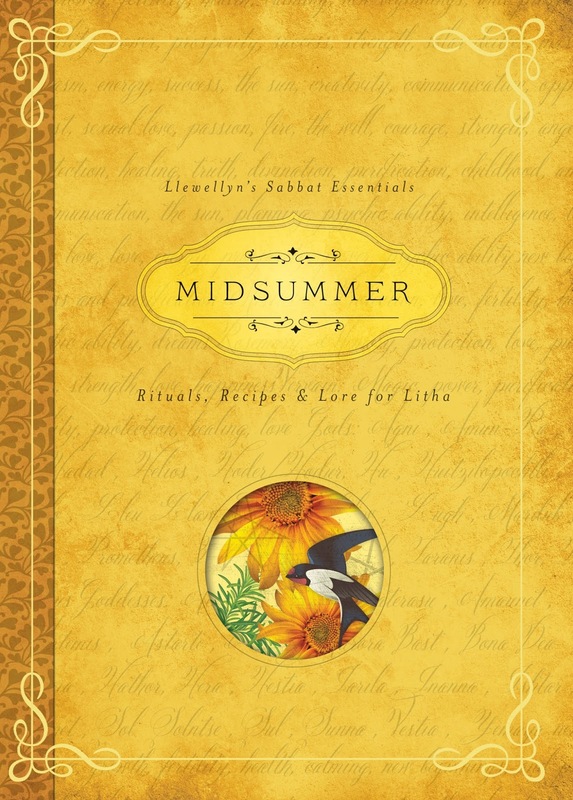 followed by the Midsummer book in May. Veiled Magic came out in mid-November. Plus, of course, there was promo and giveaways and all that for all the books I had out already. Plus my column for Witches & Pagans, and a few misc. articles for Llewellyn. Then in December, I signed a contract with Llewellyn for one more book, tentatively called "365 Days of Everyday Witchcraft." So a good year, but INSANE. Hopefully 2016 will be a tad bit calmer. Yeah, sure. That could happen. February--San Diego to visit my family and then on to San Jose for Pantheacon, one of my favorite Pagan conferences, where I got to hang out with my step-daughter Jenn, my beloved Llewellyn editor Elysia and publisher Bill, as well as lots of other cool folks. August--Eight days after I returned from NYC, I took off for Boston to join my extended family for a long-overdue family reunion vacation in Cape Cod for nine days. The highlight of that was getting to spend time with my cousin Peter and his wife and two amazing boys, who I hadn't seen in years (or in the youngest boy's case, ever). Also, you know, BEACH. November--Author pal Nancy Holzner and I headed to Saratoga Springs for World Fantasy Con, where I got to spend lots of time with author friends old and new, including the fabulous Carol Berg and Lucienne Diver. To say that I am happy to be done with traveling for the year would be a huge understatement, although I am heading back out in February for four days in Daytona Beach for Coastal Magic. The beach in San Diego. In February. And running The Artisans Guild and making jewelry, and doing all manner of work on my house...so pretty much, life. But a good one. I hope that you had a great 2015. I'd love to hear what the highlight of your year was. I think mine was meeting Tamora Pierce. What was yours? Thanks for spending this year with me, and I look forward to sharing 2016 with you--may it be filled with health, prosperity, achievement, joy, love, and at least a little magic! Yule, also known as the Winter Solstice, starts either Monday night or Tuesday morning, depending on which part of the country you live in. (If you're in the Southern Hemisphere, you're observing the Summer Solstice instead, of course.) In celebration of all the holidays at this time of year, as well as my new Llewellyn book contract (you KNEW I was going to do a giveaway for that, right?) I'm going to do one last giveaway this year. It's a cool one! Everyday Witchcraft tote bag and notebook, plus a broom ornament, plus swag! OMG! Look what's on the back of the tote bag! The giveaway includes a reversible oversize tote bag with EVERYDAY WITCHCRAFT on one side and The Witch's Broom (still on sale in Kindle form for only $2.99, but I have no idea for how long!) on the other side. Also, the last of my Everyday Witchcraft notebooks, and a cool Yule broom ornament I special-ordered from some lovely Pagans in France on Etsy to give to my family and friends--this was the last of those, too. See how special y'all are? Plus, of course, some misc. swag and bookmarks and such. Tell me, what do you celebrate at this time of year? Hanukkah, Yule, Christmas, or some combination? What do you do to celebrate? Wishing you all a fabulous holiday season and a blessed Yule! I keep saying that I'm not going to be writing any more books for Llewellyn, because writing the novels for Berkley is taking all of my time these days. In fact, I've been saying that for a few years. But then my beloved editor Elysia asked me if I could write The Witch's Broom book (the Kindle version is on sale for $2.99 right now, btw), and since she's my favorite, I had to say yes. Then I got the idea for Everyday Witchcraft and I just had to write that one. But that's it, I said. Absolutely no more. Only, um, I got this idea about a year ago. And I was silly enough to mention it to Elysia at Pantheacon last February, and she mentioned it to Bill, the publisher, who was there too, and they both said, "We REALLY want you to write this book." I said no. I swear I did. I'd just gotten the second Berkley contract with two new novels, a new novella, and the revisions for Veiled Magic and there was no way I was going to have time. Absolutely not. Every once in a while Elysia would email me and say, "Hey, when are you going to write that book we talked about?" or "Gee, Bill reminded me I should ask you about that book." "No," I said. "Can't possibly do it. Way too busy." But here's the thing...it's kind of a cool idea. I've had lots of fans ask me if I could do a year and a day book, or some kind of witch's devotional, or something along those lines. So the idea I got, almost a year ago, was to do a 365 Day book that would take the reader on a path through the year that would teach, inspire, and recharge them, no matter what their level of experience or the depth (or lack thereof) of their practice. It could be used as a personal year and a day journey, or as a devotional, or just for fun. Did I mention I love 365 Day books? I have them for writing, and witchcraft, and other spiritual paths, among other things. Magic the Cat insisted on helping with the picture, so I guess she likes them too. So when Elysia emailed me again a few months ago and said, "REALLY, Bill wants to know when you're going to sign the contract for this. We really, really want you to write it!" I um, kinda said, "Okay, you win. I'll write it." The contract for the tentatively titled 365 Days of Everyday Witchcraft got signed this week, just in time for Yule. Consider this my gift to you, my readers, who have been so lovely about supporting all my previous work. It won't be out until late in 2017, because, you know NOVELS (and the tarot deck that's coming out in January 2017), but you will be getting one more witchcraft book from me. This is the last one. I mean it. Seriously. 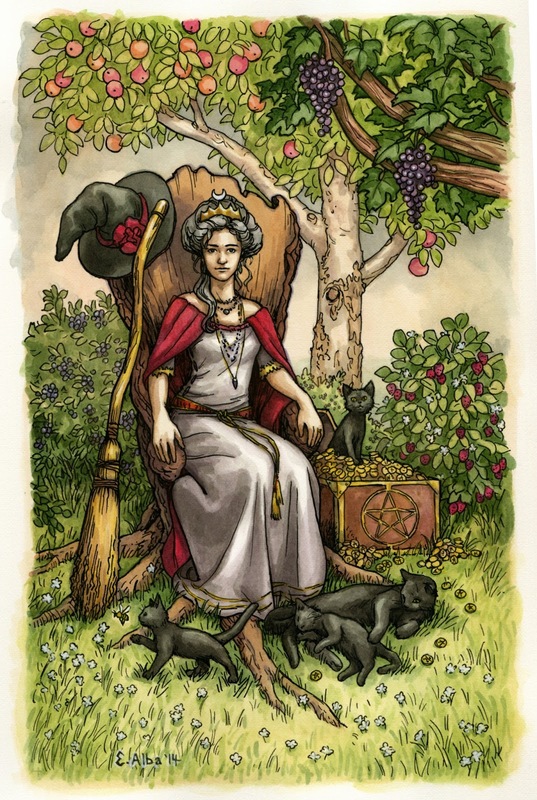 As many of you know, we (author Deborah Blake and illustrator Elisabeth Alba) have been working all year on a tarot deck for Llewellyn Worldwide. There was an important meeting at Llewellyn this week and we have a few exciting things to announce. First off, we finally have A TITLE! Introducing…EVERYDAY WITCH TAROT (and its accompanying book, The Guide to the Everyday Witch Tarot). Ta da! This is what Elisabeth looked like after finally finishing the last painting! The deck will be out in January 2017, a little over a year from now. We can’t wait! For those of you who are impatient to get this deck (and who could blame you), Elisabeth and I will be posting an occasional "sneak peek" until it is released. So, anyone else excited too? So it has been about two weeks since Veiled Magic came out, and people seem to like it. YAY! I'm so happy, I decided to do another giveaway, just because I can. And to say thank you to all of you, for helping to make the book a success. There's a Veiled Magic tote bag and notebook, plus a postcard, and a broom pen, plus a cute stuffed dragon because, seriously, who doesn't need more cute? I might toss another couple of fun things in there too, you never know. Here's a couple of cool screen grabs I took off of Amazon while I was (coff) NOT obsessively checking to see how the book was doing. The second one is Amazon's "Customers who bought this item also bought" list--OMG! I'm listed with Patricia Briggs, Jennifer Estep, and Ilona Andrews...now that's some good company to be in. So tell me, did you get a copy? And if you did, have you read it yet? Did you like it? (Not that authors care about such things...just curious.) Or, you know, just comment on something. 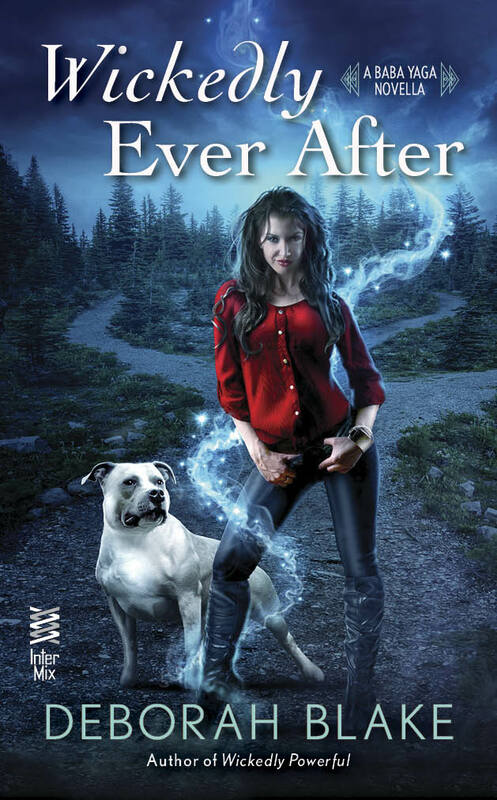 Next up, I'll be talking about the first book in the Riders series (a continuation of the Baba Yaga books, starring the Riders). And how the book tried to kill me. 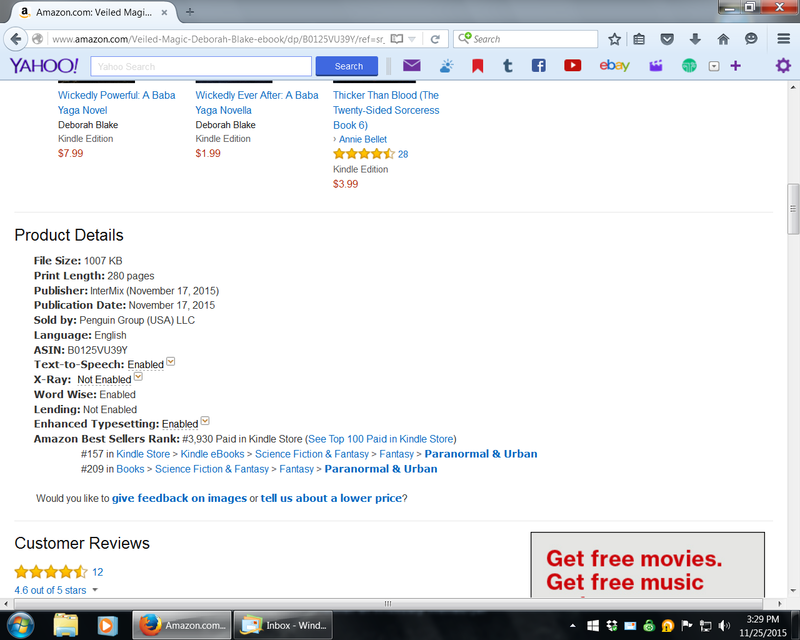 Thanks so much to everyone who bought Veiled Magic, talked about it to their friends, or just cheered me on. You guys rock. Happy release day to me! (And to all of you who plan to read the book, of course.) I'm so pleased to welcome VEILED MAGIC to the world! Now I just have to keep myself from obsessively checking the Amazon rankings... Book release days are both fun and nerve wracking! Magic the Cat says, "I read it and really liked it. Well, I kind of liked it. At least there's a cat in this one." Mystic wants to know if you're going to read it. He's curious that way. Here are a few handy Buy Links if you feel overcome by the sudden urge to go get yourself a copy. I hope that people love this one, because I sure do! So tell me, what should I do to celebrate? And if you read it and like it, be sure to let me (and, you know, the rest of the world) know! OMG! The book is out! Happy dance time! I can't believe that VEILED MAGIC is out in a week! I have been waiting a long time for this book to make its way out into the world. (It was the book that got me my agent four years ago, but we didn't sell it until this year.) I'm a little excited. *dance dance dance* Ahem. 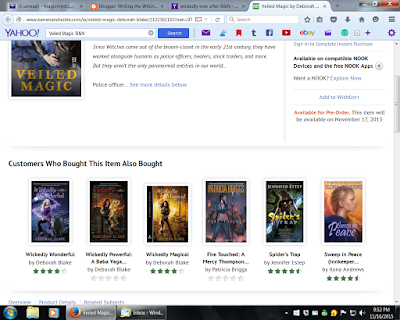 Veiled Magic will only be out as an ebook, but if you don't have a reader, and don't happen to win one at my KINDLE FIRE HD GIVEAWAY (which ends on Friday, October 13th), you can still download it onto your computer using the free Kindle app. Just sayin'. A cool Veiled Magic mug! As always, no purchase is necessary. This one is open to USA only, because of the shipping, but no worries, there will be plenty more giveaways coming up soon. All you have to do to enter is to leave a comment on the blog. And since we're not using Rafflecopter for this one, be sure to leave an email or facebook name or some other way to get in touch with you if you win. ONE WEEK!!!!!!! Who is excited?